Sweet, smoky flavored cherry tomato. Very productive. 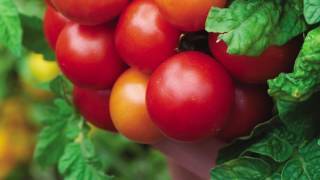 This gorgeous cherry tomato is a vast improvement over the heirloom tomato Chocolate. Sunchocola fruit has more smoky, sweet flavor, juicier texture and lower acid. Productive, dark green, indeterminate plants produce clusters of 8-12 fruits measuring 1" wide x 1/5" long and weighing slightly more than an ounce. Resistant to Tomato mosaic virus. Tomato, Sunchocola Hybrid is rated 4.4 out of 5 by 21. Rated 5 out of 5 by Garman from Nice and big. This is a beautiful cherry tomato. All the fruits have ended up being a little more than an inch across. They're a lovely color – rich, almost leathery in appearance. They are incredibly hardy tomatoes that resist cracking better than most, and also hold up to all sorts of cooking methods. Delicious. I'll edit this for an end-of-year review. Note about my growing zone: I'm in 7b (Center City Philly), but it's a little misleading. I do container gardening on a roof deck, where it absolutely bakes. It's routinely 7-10 degrees warmer than the street below, I've seen readings of 106+ this summer (in the shade), so a lot of the time I have the tomatoes covered with shade cloth (which you can see on the pilot house in the third photo). 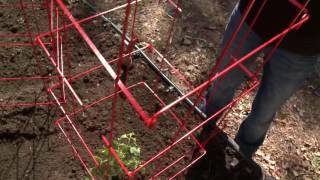 I water with a basic Raindrip irrigation system. Rated 4 out of 5 by sy5temfire from A large cherry tomato and so juicy First year getting these. Flavor is deeper and richer than a typical cherry tomato. Not as dark colored as I expected. So juicy. At least 2-3 bites, they are bigger than most cherry tomatoes. Would purchase again and I'm not even a fan of red ones. Plant really picked up starting in July. Tons of yellow blooms still waiting to make me more tomatoes! Rated 5 out of 5 by BeckyD from Great flavor I grew Sunchocola for the first time last year, and it quickly became a household favorite. Rated 5 out of 5 by DannyBit from Excellent yield I have grown these two years in a row with excellent yield and the best flavor of a small tomato. Rated 5 out of 5 by JPurdy from LOVE these cherries! Probably my favorite of the cherry tomatoes I've grown. The smoky flavor is amazing, and if you're doing a tasting of one variety after the other, it actually has an oddly 'cola' edge to it. Prolific like most cherries. Stunningly gorgeous color to go with the taste. Definitely winning a place on the 'permanent addition' list. Rated 5 out of 5 by Chris6510 from It's turning into a monster This is one fast-growing, prolific plant! I put it in the plant in April, and now it's taller than I am. Tons of fruit that taste wonderful--got the first ripe ones last week. No signs of pests or diseases, haven't had to spray yet. Easy to grow. Rated 5 out of 5 by Joe Tru from Best cherry tomatoes ever These are so sweet and smooth. Hands down the best cherry tomato I've ever had. I have grown several varieties but none come close to the flavor of these! Rated 4 out of 5 by OldGardener123 from Wonderful Flavor, Unfortunately a Little Finicky The flavor of these tomatoes is really amazing and the fruit is beautiful. I don't know if it was our blazing hot summer, but these plants just did not perform as well as I was hoping. They are definitely worth trying again if they don't work well for you the 1st time - if you have space in your garden - we will be, but if they don't perform well again this summer, we will wait for a different winner.